On April 16 at approximately 1:10 p.m., Calcasieu Parish Sheriff’s Office deputies responded to a local motel located on West Prien Lake Road in Lake Charles in reference to 3 children, ages 8 months, 10 months and 2 years old, being left alone in a room. When deputies arrived they spoke with a motel employee who stated she discovered the 8 month old girl wandering around on the 2nd floor balcony. She told deputies she learned which room the child came from, and when she entered the room she located the other two girls alone. 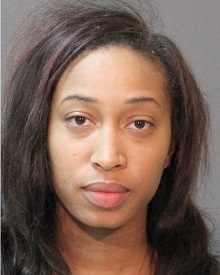 At approximately 1:45 p.m., a women, identified as Logan A. Martin, 21, Jeanerette, LA, arrived at the motel and advised deputies she was responsible for the 3 young girls, one of whom was her child and the other two were family members. She told deputies she had left the motel and had been gone for approximately 45 minutes to 1 hour. After further investigation Martin, who was also found to be in possession of a small plastic bag containing marijuana, was arrested and booked into the Calcasieu Correctional Center and charged with 3 counts of child desertion; and possession of marijuana. She was released the next day on a $6,500 bond set by Judge Clayton Davis. CPSO Deputy Cpl. Ryan Tarver is the arresting deputy on this case.